Matias has launched a new USB 2.0 keyboard that is design to semi integrate your smartphone so you have easy access to it whilst using your keyboard. It features two USB 2.0 ports on the rear of the keyboard and one on the top. It also features a smartphone stand that is build into the keyboard just above the arrows keys, with a non slip silicone pad, so that you can use various application on your iPhone or smartphone at the same time as using your keyboard. It seems like an interesting idea, one feature that would have been good to have seen in the keyboard would be the ability to charge and sync your iPhone or smartphone whilst it was docked with the keyboard. 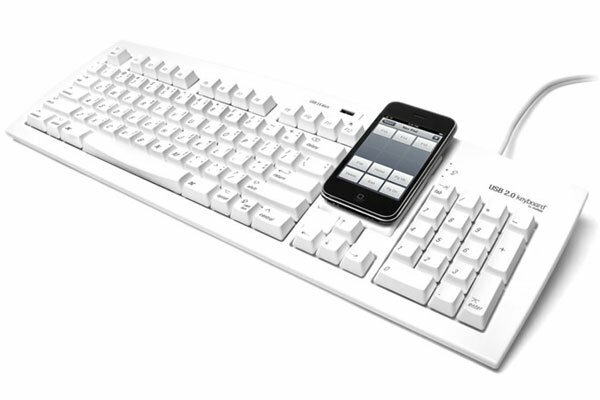 If you want one, the Matias USB Keyboard With Built In Smartphone Stand is available for $49.95 from Matias.